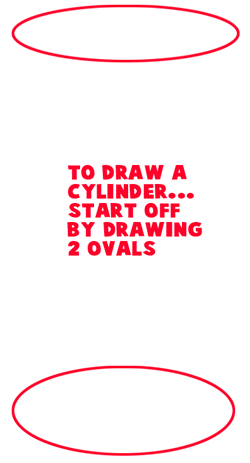 First of all, we will show you how to draw a very basic cylinder. Start off by drawing 2 ovals a bit of a distance away from each other…as seen in the picture above. 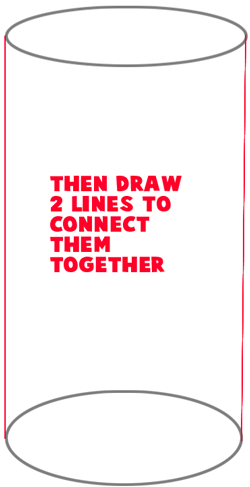 Now, draw 2 lines connecting the 2 ovals together. 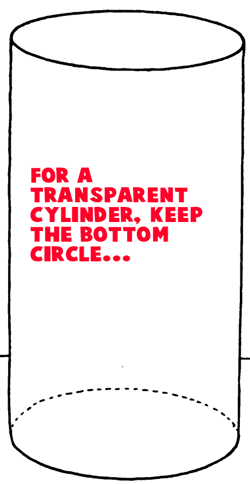 For a transparent cylinder (cylinders that you can see through), keep the bottom circle…but…. 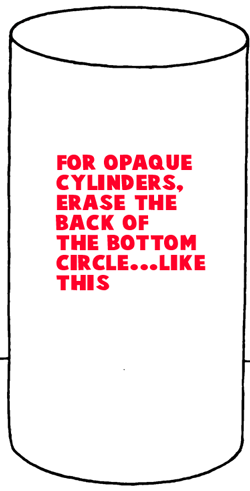 For opaque cylinders (cylindrical objects that you CAN’T see through), erase the back of the bottom circle…like you see pictured in the image above. 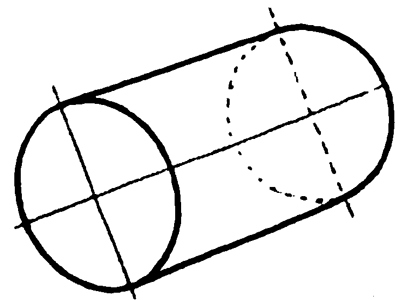 Draw this cylinder, just like the first cylinder, except this time don’t draw the ovals on top of each other…draw one to the right and a bit above the first oval. Then connect them. 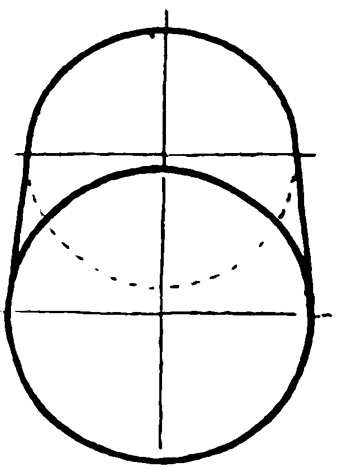 In this above oval…you will draw 2 circles….overlapping each other. Then draw a plus sign in the center of each circle. Then connect the 2 circles where the center is…as seen in the picture above. 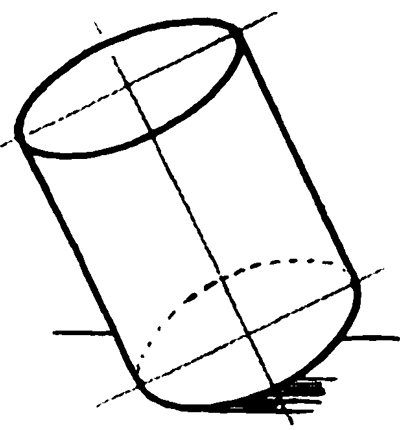 In the example above, the cylinder is on its side as if it is going to fall soon. Just draw 2 ovals that are slanted a bit…the top one is a bit to the left and above the first oval….then just connect them with 2 lines. 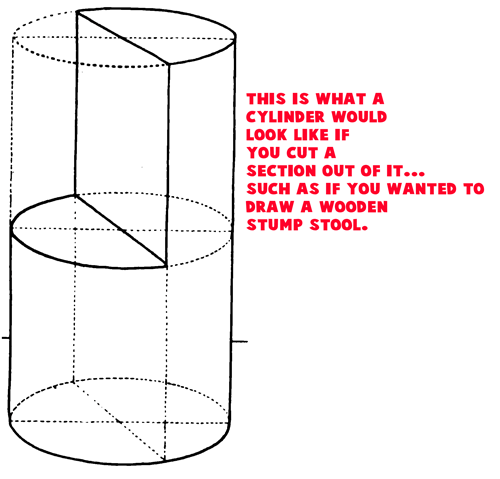 This cylinder in cut up to show you how you would draw a shape out of the cylinder. The light strikes the cylinder from the left in the picture above. Receding around their contours to our right we find the half tone, shadow, and reflected light. 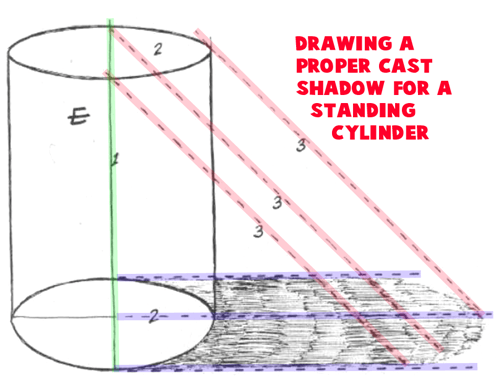 To the cylinder’s base are the strongest values – the case shadows. 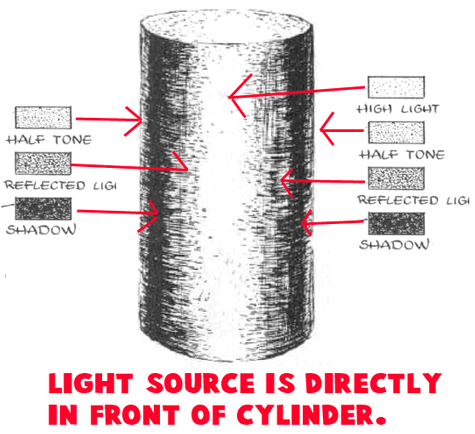 In this cylinder, the light source is directly in front of it. Here you will see that the high light is centered on the object. You will then notice that the object takes form and solidity, as it is shaded on each side of its high light. 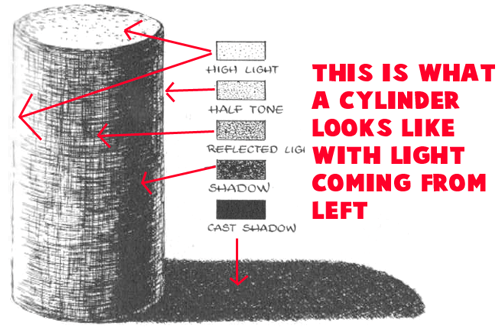 The shading follows the logical order of half tone, shadow, and reflected light. 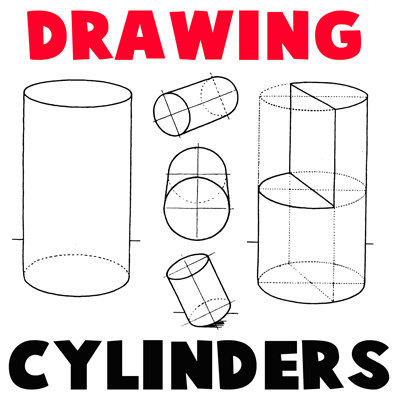 Draw a vertical line through center of your cylinder. Draw horizontal lines at top and bottom of central points (illustrated in the lines labeled #2 above). Draw forty-five degree lines (as indicated by the lines labeled #3 in the pic above) and connect to form cast shadows. Draw 45 degree lines from outer edge to ground plane. 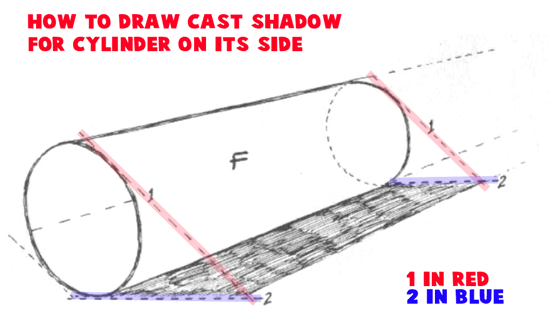 From this point draw lines back to base of cylinder, forming cast shadow. I want to show you what happens when you place an object in a cylinder or cup with liquid inside it. 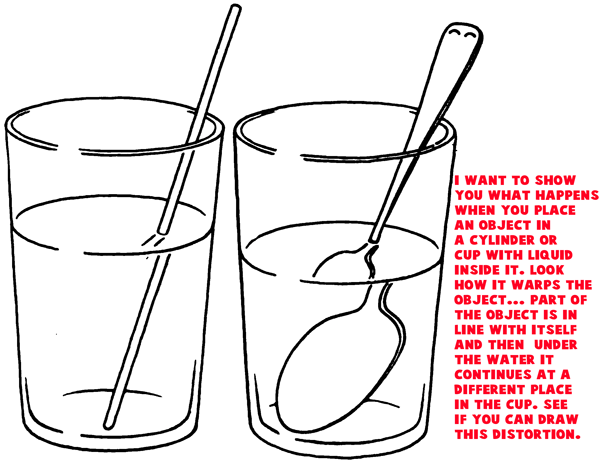 Look how it warps the object… part of the object is in line with itself and then under the water it continues at a different place in the cup. See if you can draw this distortion. Very good! I will go to make this exercices.Thanks.